Whether your future proposed warehouse is taller, your loads heavier, or you wish a racking structure a little tougher against the rigours of lift truck abuse, structural racking has been increasingly gaining acceptance as the most cost effective choice for warehouse storage racking. 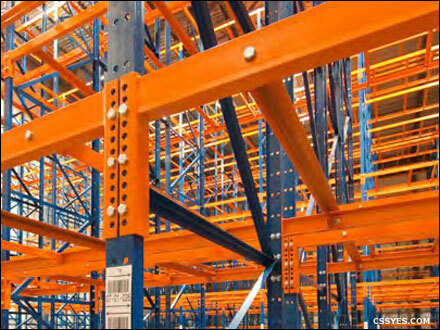 Typically built of either 3, or 4 inch “C” channel steel, structural end frames are often quite cost competitive in the long run and can take the place of any racking uprights. Although these frames require bolt on connectors to support load beams, this doesn’t necessarily mean the beams must also be structural. In an effort to keep costs down, it is becoming increasingly common to use rolled form beams with this type of racking structure. In fact, it is also possible to build structural rack up to 4 to 6 feet with a rolled form frame fused on top.